Bryson DeChambeau enjoys extensive (and exhaustive) research to uncover elusive answers. After recent struggles, BD hunkered down last week using all available sunlight at Dallas National GC until happily finding his pot of gold. Jonathan Wall reports on how the 14-hour(!) range session ultimately delivered as hoped (DeChambeau tied for the Masters 1st round lead at 6-under with Brooks Koepka). DeChambeau suddenly went from hoisting trophies and cashing top-10 checks to finishing no better than T20 in his last three stroke-play starts. 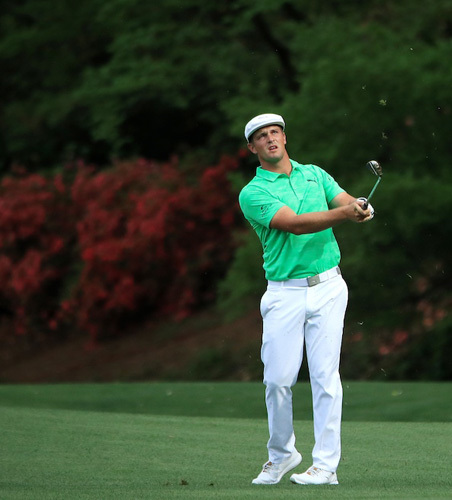 Every pro is entitled to an off week or two, but DeChambeau felt something was amiss. In an effort to gain more consistency with his wedges, Schomin and DeChambeau tested different head weights — some of them 300 grams instead of the 275 grams he had been using — with lighter JumboMax prototype grips, made from a hard foam instead of rubber, but the new club builds didn’t feel the same or solve the issue. That’s when the two started looking at shafts. DeChambeau plays True Temper’s Dynamic Gold X7 in his irons and wedges, better known as the stiffest shaft the company produces. It’s so stiff, in fact, only a handful of players in professional golf are able to benefit from the profile. With DeChambeau already altering known equipment variables, he decided to try a softer True Temper Dynamic Gold S400 shaft profile — and something immediately clicked, producing the feel and consistency he was looking for. The results were so good, he wound up adding the shaft to his wedges and Cobra Forged One Length irons (6-PW). “I’ve had some disadvantages with a couple of the irons I’ve had for a little bit, and just being able to practice and getting comfortable and seeing the ball flights come out the proper way for the first time ever in my life is pretty cool,” he said. You may not be a Bryson fan, but one cannot argue his never-ending commitment searching to uncover solutions. Meanwhile, he came this close to an ace yesterday on the par-3 16th hole. What’s crazy is DeChambeau admitting never-ever-having had a hole-in-one. Nada. Zilch. Zero. Ironically, neither do I. Somehow that heals the open wound just a bit. “No I’ve never ever had one [hole-in-one],” said DeChambeau.